ALBUM REVIEW: Family Reunion "Family Album"
If you have brothers or sisters that live far away, you probably talk at least a few times a year - maybe every couple of months or more. However, cousins who live in different parts of the country rarely speak - except for the yearly Christmas card. That's what makes the success of Family Reunion's new album "Family Album" all the more special. Six cousins - yes, the number six - have created a band that records its one-of-a-kind brand of country songs using alter egos to protect their serious day jobs (such as accounting). 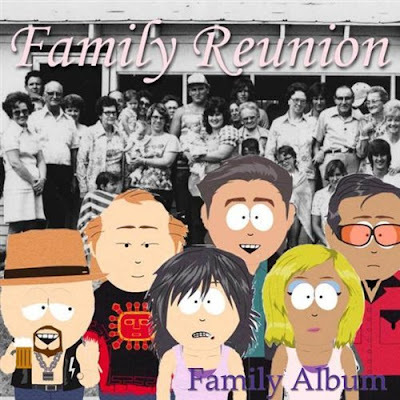 Indeed, the Family Reunion band is somewhat like the British group Gorillaz - except with a few more jokes and some country attitude.